The Berry family of Houston, Texas hired us to do swimming pool renovation in their backyard. The pool was badly in need of repair. Its surface, plaster, tile, and coping all needed reworking. The Berry’s had finally decided it was time to do something about this, so they contacted us to inquire about swimming pool restoration. We told them that we could certainly repair the damaged elements. After we took a closer look at the pool, however, we realized that more was required here than a cosmetic solution to wear and tear. Because of some serious design flaws, the aesthetic of the pool worked against surrounding landscape design. The rear portion of the pool was framed by architectural wall, and the water was surrounded by a brick and bluestone patio. The problem lay in the fact that the wall was too tall. It created a sense of separation from the remainder of the yard, and it obscured the view of a beautiful arbor that had been built beneath the trees behind the pool. It also hosted a contemporary-style, sheer-descent waterfall fountain that looked too modern for a traditional lawn and garden design. Restoring this wall to its proper relationship with the landscape would turn out to be one of the key elements to our swimming pool renovations work. We began by lowering the wall the wall so you could see the arbor and trees in the backyard more clearly. We also did away with the sheer-descent waterfall that clashed with surrounding backyard landscape design. We decided that a more traditional fountain would be more appropriate to the setting, and more aesthetically apropos if it complimented the brick and bluestone patio. To create this façade, we had to reconstruct the wall with bluestone columns rising up through the brick. These columns matched the bluestone in the patio, and added a stately form to the otherwise plain brick wall. Each column rose slightly higher than the top of the wall and was capped at the top. Thermal-finish weirs crafted in a flame detail jutted from under the capstones and poured water into the pool below. To draw greater emphasis to the pool itself as a body of water, we continued our swimming pool renovation with an expansion of the brick coping. This drew greater emphasis to the body of water within its form, and helps focus awareness on the tranquility created by the fountain. We also removed the outdated diving board and replaced it with a diving rock. This was safer and more attractive than the board. We also extended the entire pool and patio another 15 feet toward the right. This made the entire area a more relaxed and sweeping expanse of hardscape. While doing so, we expanded the brick coping around the pool from 8 inches to 12 inches. Because the spa had a rather unique shape, we decided to replace the coping here with custom brink interlace style that would fit its irregular design. Now that the swimming pool renovation itself was complete, we sought to extend the new sense of expansiveness into the rest of the yard. To accomplish this, we built a walkway out of bluestone stepping pads that ran across the surface of the water to the arbor on the other side of the fountain wall. 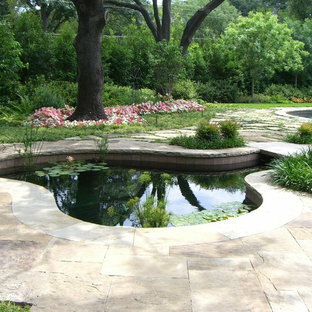 This unique pathway created invitation to the world of the trees beyond the water’s edge, and counterbalanced the focal point of the pool area with the arbor as a secondary point of interest. We built a terrace and a dining area here so people could remain here in comfort for as long as they liked without having to run back to the patio or dash inside the kitchen for food and drinks. 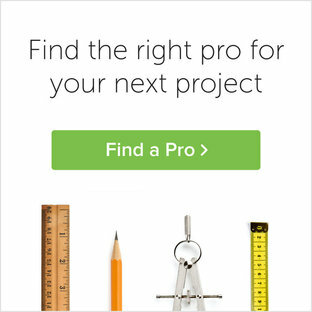 By Landscape Perceptions of DiTomaso Design Inc. 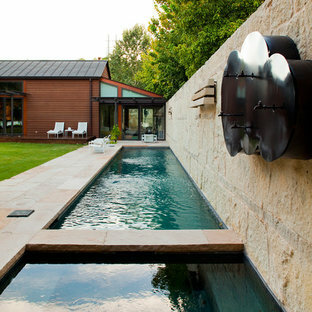 This water fall empties into the pool to convey the natural setting and appearance of being part of the environment. Randy Angell, Designer Advertisement Outdoor Living Room This backyard was separated into different areas for entertaining or relaxing. The outdoor living room area is complete with an eating area, fireplace and fully equipped kitchen. The kitchen island alone features a sink with storage underneath, a two-drawer beverage refrigerator and a pullout trash bin. Granite countertops on the island couple as a bar seating area. The cooking area houses a stainless steel grill, a warming drawer, a storage drawer, a side-burner unit and a 24' under-counter refrigerator. A custom-made Mexican lantern chandelier sets a festive mood for the space. 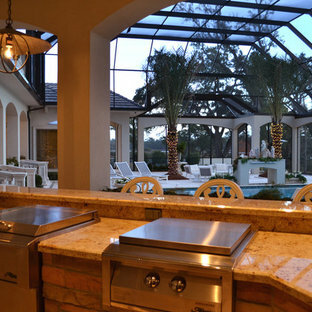 Designer, Randy Angell A wooded oasis complete with all glass tile fountain, fog system and cannon jets to create a mystical, fantasy inspired ambiance. 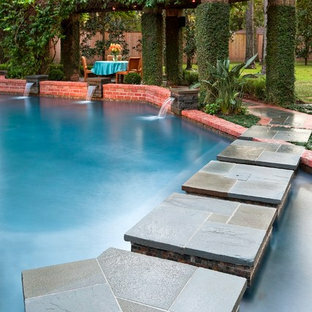 A collection of selected luxury swimming pools designed and built by Harold Leidner Landscape Architects for private residences in the Dallas, Texas area. A variety of shapes and styles to reflect the site, architecture and lifestyle of our clients. Peaceful waterfall pouring into pristine hot tub. 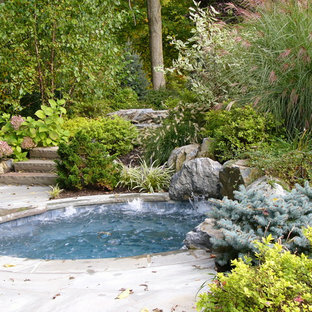 By Poole's Stone and Garden, Inc.
Add rock or a water fall to your pool to give it a more natural look!